This photo taken on March 30, 2018 shows Kahori Ochi (L), owner of a kimono rental shop, fitting a kimono to Dutch tourist Ruby Francisco (C) at her shop “Sakae-ya” in Tokyo. “The kimono has become something that is very far removed from our daily lives,” said Hirose, who joined his family business after university. He specialises in “Edo Komon” — a kimono pattern hand-dyed with a Japanese washi paper stencil, which dates back to the Edo period between the 17th and late 19th centuries. It’s a deeply traditional craft that requires great skill to master, he said, “but we need to create something that is accepted in this modern time”. Hirose’s innovations include developing new designs to adorn the kimono, including tiny sharks or even skull motifs. “There are many hurdles” to buying a kimono, said Takatoshi Yajima, vice chairman of the Japan kimono promotion association, and a kimono manufacturer. “It’s expensive. It’s difficult to wear. It’s too delicate to wash at home,” he said. “The industry will grow if we can create a market in which as many people as possible will buy a kimono,” he said. “What’s fabulous, what’s unfashionable and what’s cool change every year. It’s wrong that kimonos don’t change even if everything else is changing,” said the Kyoto-based designer, whose work has been worn by American singer Lady Gaga. At Tokyo fashion week in March, Saito, who calls himself “a risk taker,” showcased kimonos for men and women, mixing traditional and unconventional motifs and colours. “I want to present kimonos as a wardrobe in which people can truly feel joy,” he said. “Kimono is a piece of Japanese culture. I really wanted to experience that,” said Ruby Francisco, a Dutch tourist who rented a pale green kimono at Ochi’s shop. “It’s special. It’s like an honour to wear,” the 33-year-old said, adding that she would post photos of herself in the kimono on social media to show her friends. Ochi’s mother ran a shop selling high-end kimonos, but she didn’t expect to follow in her footsteps. 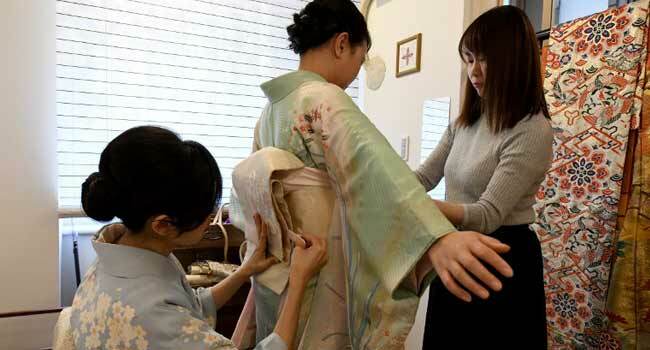 “My mother told me the kimono business is risky and volatile,” she said, adding that her mother’s shop struggled after the bubble economy ended in the early 1990s. “She said ‘no salary for you,'” Ochi laughed, recalling her mother’s surprise at her sudden interest in the industry. “But my goal is not to expand the business,” she added.